Since 2005, the Procter & Gamble brand has brought its portable laundry services to people hit by tragedy. And this week, the Tide mobile laundry unit came to Redding, California, a community wrecked by wildfires. Residents impacted by the fires, and volunteers helping to fight the blaze, can bring up to two loads of laundry per family to be washed, dried and folded. 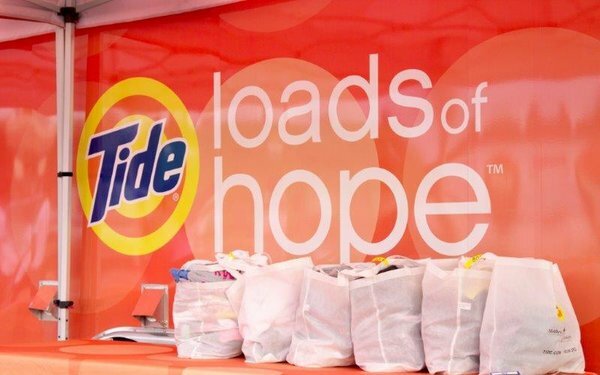 The Loads of Hope truck, equipped with 32 washers and dryers, can handle 300 loads a day. It arrived Thursday in the parking lot of a Walmart in Redding. Disasters like the California wildfires often trigger charitable acts by businesses and individuals, sometimes even too much so. The Sacramento Bee reported that after the 2015 wildfires in Napa Valley, so many donations came in, 18 semi-trailers hauled away items that weren’t needed. Businesses do their part, too. Walmart and the Walmart Foundation have pledged at least $200,000 to help local aid organizations provide help to victims of various disasters. Duracell often shows up, giving away batteries at a time people may really need them. Anheuser-Busch has in the past switched off the beer taps and bottled water instead to send to disaster victims who need it. Many California labor unions have started wildfire relief efforts. GoFundMe has organized a section of its site for people looking for ways to donate help to victims of the latest wildfire. Certainly, companies can and do commit acts of kindness without obvious ulterior motives. But it doesn’t hurt. A “doing good by doing well” trend has developed in the last few years as marketers have discovered consumers increasingly favor brands that have a good public-spirited sense. A 2014 Nielsen survey disclosed 55% of consumers worldwide would be willing to pay for goods and services provided by a company committed to positive social and environmental impact, up 10 percentage points from four years previously. In the U.S.,the percentage was lower (42%), but it was up by 7 percentage points. More recent statistics show a majority of consumers want brands to “stand for something” and have a social commitment. Loads of Hope was founded after the devastating Hurricane Katrina in New Orleans. Since then, it’s arrived at the scene of disasters in Texas, North Carolina, North Dakota and Tennessee, among other places. Victims of the latest disaster also received a CARE kit of P&G products. Tide also offers vintage Tide-logo t-shirts at a Loads of Hope website, and $4 from each sale goes to disaster aid.